Right. Not even an “I’m afraid not.” These New Yorkers, they give it to you straight. Oh, dear. I fingered the tip in my hand…when does one hand it over? The concierge had leaned over and begun to deal with her next victim. She glanced at me. Was I still there? “You’re done now,” she said. Redundantly, I put down the dollar bills next to her and wandered Englishly away. Sod it. I was walking there. Maddie is not a subway fan, and we’re British. We could stand a little rain. Phil and Felix were heading for The Art Of The Brick, the Lego exhibition, and Mad and I were returning to the building I had fallen in love with six years before. The Guggenheim. Frank Lloyd Wright’s cylindrical wonder, wider at the top than the bottom, a ‘temple of the spirit’ which opened in 1939 on New York’s Upper East Side and has been wowing the discerning public ever since. We stepped out of the hotel into torrential rain. And walked, and walked, skirting Central Park up Fifth Avenue, taxi lights playing Tinkerbell with the flooded tarmac. The trees which line the Park edge lent a charm to each step though we did squelch towards the end. Finally, finally, we reached Solomon’s legacy. As we trailed in men in uniform were handing out bags to put dripping umbrellas in. Everyone in New York had wet feet. Even on Fifth, we were equal. No photos, they said. Grrrr. But it would all be all right, because in a second I would see what I had come to see: folks craning over the balcony of a spiral walkway, lining the cylinder, all the way to the top. 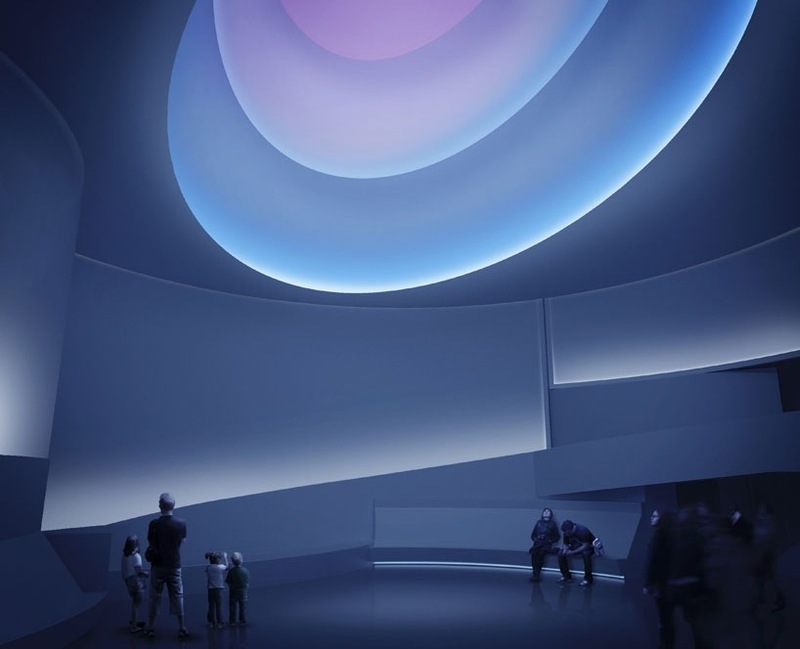 Thanks to iconic artist, admittedly a beautiful and wondrous creator, James Turrell, who has gagged the Guggenheim: swathed that spiral in canvas so that one cannot look over. Now the whole gallery is a trippy experiment in planes of light and colour. He has stapled white canvas to the whole infernal building. So you can lie down as if you were on some forbidden substance at the base of the gallery and watch the colours change in a pretty spiral. But you will not see the Guggenheim. Not really. We enjoyed the art, especially Kandinsky and the cupcake in the coffee shop. And then we stepped outside, put up our umbrellas, paddled to Central Park and watched the sparrows. Clearly, I shall have to come back when Mr Turrell has taken down his tent and cluttered off home. Posted in Places to visitTagged art, gallery, Guggenheim, New York, travelBookmark the permalink. Sorry it is raining outside. That last ‘blue’ picture is wonderful. It is, but it’s not the Guggenheim with people craning over the balconies. I like that one…. Love the last photo, as well as the two long shots down the brick sidewalk. But I do take issue with any “art” that consists of covering up or hiding someone else’s art, including Mother Nature’s. It’s arrogant and thoughtless. Hear, hear, PT. Because of Mr. T I shall have to come back again soon. Joseph’s Coat Skyspace is a triumph of technology, engineering and aesthetics. The Skyspace, created by internationally renowned artist James Turrell, is a gathering place for contemplation, and sustained experience. At sunset, a sophisticated system of LED lights is employed to change the color of the space. In doing so, the artist changes the context in which you view the sky and can radically change your perception of the color of the sky and its spatial relation to you. As you gaze up at the sky through the 24’ square aperture in the ceiling, you are invited to contemplate light, perception and experience. Daytime or sunset, rain or shine, Joseph’s Coat is a unique experience. Sounds like you and Maddie enjoyed your outing despite the rain, the crowds, the shrouds, and the gagging sounds coming from the Guggenheim. 😀 We did, Nancy. I grumble, but it was home from home for us. We loved it. I can’t believe you were told you couldn’t walk up there. I have walked it numerous times. Even in bad weather, it isn’t a bad walk. Did the boys like the Lego? I also love that last shot. I am sorry the experience didn’t live up to memory. That’s always the risk when I decide to repeat a thing. Whilst watering the garden i realised that of course I meant “artists’ “….it’s their fault. Ha 😀 Bloody creatives. Can’t decide where they want their apostrophes. Love those long shots up the walk with the spots of bright yellow looming out of the wet. 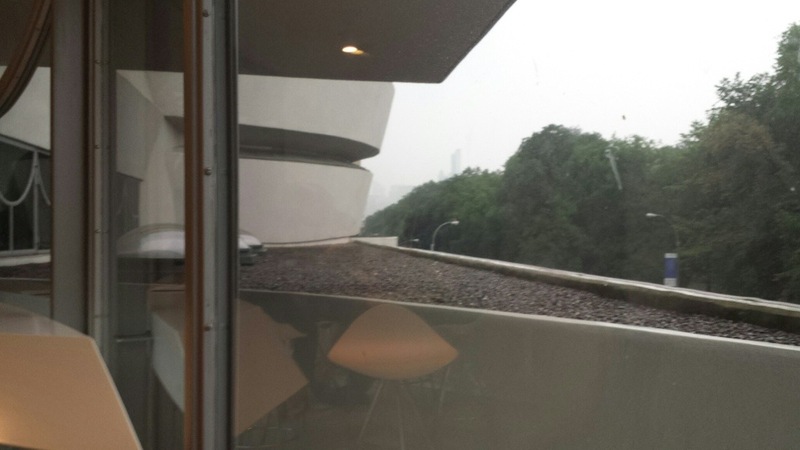 Sorry, your view at the Guggenheim wasn’t quite as planned. Ho hum, Karen. I guess it was still the Guggenheim. I fell in love with Kandinsky because of them. i also walk in order to avoid subways…or trolleys or any other forms of transportation I find confusing. I have walked the impossible in San Francisco simply because I couldn’t figure out how to get somewhere other than by foot! 🙂 I’m so sorry it didn’t quite pan out to be what you’d hoped, but all the more reason for a good return! I am really enjoying hearing about NYC through your eyes! Debra, you and Andra make me feel much better. I wouldn’t have minded if I hadn’t been frogmarching my daughter along in the pouring rain! Still, it was fn. 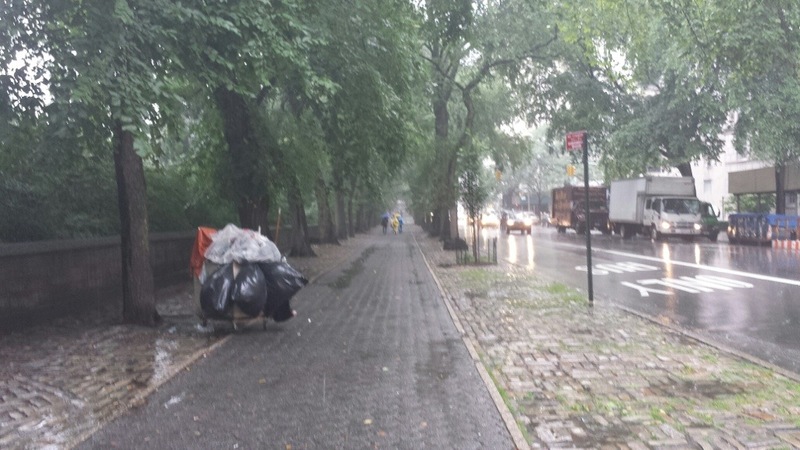 And Central Park, deserted, in the rain, with all those sparrows and starlings: it was quite wonderful. This was my grandfather’s favourite museum in the world Kate. The walk was quite something, wasn’t it? It was, especially there and back, Tandy! It is a stunning place though. 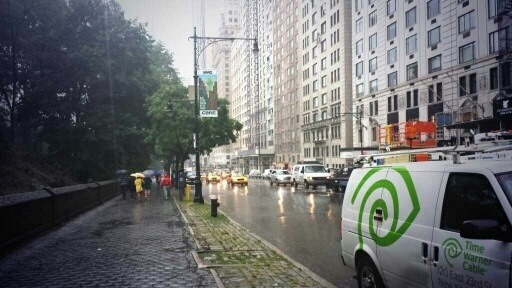 That was quite a trek, 57th and 9th to 5th and 89th in a downpour, Kate! But you are from the land of Keep Calm and Carry On. I personally would have ridden public transit. But then to finally get there for such a letdown, I would have wanted to scream. That was a great “gotcha” shot you were able to sneak so it is comforting to know that your visit to another NYC cultural institution was only a partial washout. I thought artists were supposed to paint, not play with electricity. I’m glad you had fun in NY and are safely back home. I do love the last photo. But most inconsiderate of James Turrell. 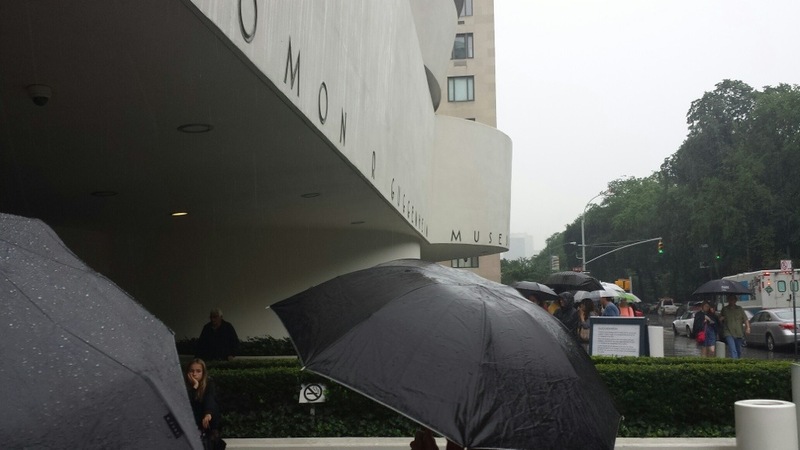 It’s the Guggenheim that draws folks. It should not be obscured by someone else’s works.